We love the Providence Community Libraries, and we love hosting Peace Flag Workshops in each of them every September as part of the Month of Peace. 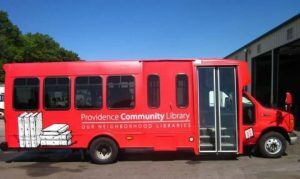 This year we’ll have a special treat from the Community Libraries as part of our Peace Fest RI 2016, on Saturday, September 24, at Burnside Park, 1:00 pm to 4:00 pm. THE BOOKMOBILE WILL BE AT BURNSIDE PARK DURING THE PEACE FESTIVAL. Come check it out.